Do you Go For No ? IF not, you should be. Without No’s, you can’t get to where you want to get to. Picture a spectrum, with Yes being on the far right. Most people picture themselves in the middle, with left being No and right being yes. That’s absolutely the wrong way to look at it. On the spectrum, you are on the far left and you must make it through the No’s to get to the Yes’s. This book by Richard Fenton and Andrea Waltz is likely the best $10 you EVER spend. 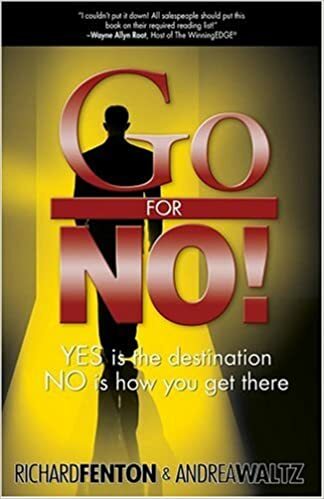 This book will teach you how to make a fundamental paradigm shift, from one of being disappointed by No’s, to one of looking for No’s and receiving Yes’s. Watch my video below for help on making this paradigm shift. Every no that you get just means you are that much closer to getting a yes. It’s a numbers game. People give up way too soon when they get those first few no’s. You need to understand they are going to come and be prepared to handle them by just going to the next person. Great training today! Thanks for the book reminder! It’s still on my list. Can’t wait to read it! It’s a very short read Jelena. You will finish it in one afternoon. Enjoy!